February is a beautiful time to hold space for the fire within with a little self-love thru self-care. We are happy to share with you a few of our favorite plant allies who nourish our sense of love, compassion, and wholeness. When we spend time with nature, we more easily remember and appreciate our own. There is no shortage of legend and lore about this humble herb. It has been used in all manor of healing tonics, and makes appearances in rites of passage ceremonies from birth to death. We love how rosemary helps the mind sharpen to emotional and body memory. Using it in baths or diffusing the essential oil can be a powerful way to work with rosemary, especially when working with rosemary regularly. But never underestimate the power of food as medicine - rosemary is healing and delicious! Combine all ingredients in a bowl, mixing well. Draw a warm bath and climb in. Set your intentions for self-love, self-care and remembrance as you pour the mix into the bath. Make sure you’re in the bath when you add the soak! This warrior plant demonstrates an ability to resist, persist and reclaim sacred ground. No plant teaches us more about resilience than dandelion. All the parts of the plant are useful, but said differently, this WHOLE plant is medicine. It is the first food of the bees, it is a revitalizing tonic, it is an ally of the Goddess Brighid, who tends the flame and the forge. You can bring all things to dandelion and they will be cared for, realigned, transmuted and transformed into something more useful. Dandelion is a favorite for healing from trauma demonstrating that we can grow wherever we must, against all odds, until one day our seeds scatter on the breeze, finding new landscapes to thrive in. Combine all ingredients. Add 4 heaping Tbsp to 16-20oz of water. Simmer (decoct) on low-heat for 20 mins. Remove from heat, strain, and enjoy. For something extra special add a touch of the syrup from the love potion recipe below. Oh dearest Leonurus cardiaca, Lion heart, herb of the mother. While I love this herb for everyone holding a mothering or care-taking role, it is a must-have for all manners and matters of self-love. 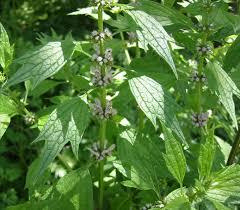 Motherwort is like the calm hand on your shoulder telling you all will be well. This isn’t said from a place of bypassing the hard stuff. NOPE! Motherwort wraps herself around you and walks you right through the storm to the other side. She knows the best isn’t around your obstacle, but through it. Mind, Body, and Spirit she soothes anxiety, fosters safety, holds the space, and gets you present with your our own strength and courage. Bring 2 cups of water to a boil. Steep 3/4 to 1 cup of herb for 20 to 60 minutes; essentially you’re making a very strong tea. Strain herbs and over very low heat warm the water, then adding the honey until fully mixed. Honey is to taste and brandy is an optional preservative.